You can buy almost anything from vendors on the streets in Kisumu. Underwear. Electronics. Chickens. The books are my favourite. It may not seem so strange; except that on our walk today we saw a 'Journal of Pediatrics' and a 'Hormone Replacement Therapy Handbook'. Assuming that this is not the first stop for doctors to purchase books, I can only imagine that means there are some regular people walking the streets here with a ridiculously technical medical vocabulary and knowledge. Makes me a bit embarrassed about my last reading purchase; Vogue. Another cool thing is the fresh fish market down by the lake. Although it is not recommended to swim in the lake, the fish are apparently ok to eat. And so we headed down to give it a try. Lisa wasn't comfortable with the 'animalness' of the whole fish, so she opted for chicken. Imagine her surprise when they served her the whole animal. We suspect this might have actually been a condor. We discovered on the way back to the hotel one of the reasons why swimming might be discouraged in the lake. It doubles as the car wash. Old school. And, from time to time, you come across names that give you pause. 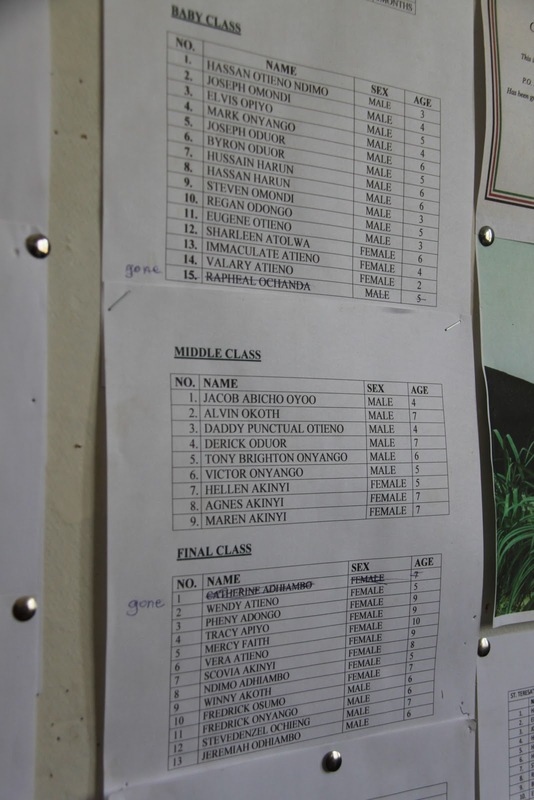 Based on the class list in the orphanage, there will be a new crop of creative names to come. My personal favourite: Daddy Punctual!